My Valentine’s Day started at work with co-workers who brought some cupcakes and plates of homemade cream puffs covered in pink chocolate! Yes, homemade cream puffs! I need to try and make them one day. Apparently it’s easy to make. Later in the afternoon, we had root beer floats! I’m actually not a fan of root beer floats in general. The concept of it just doesn’t make sense to me. It never did since 3rd grade. But. I decided to be part of the Valentine’s spirit by giving root beer float another chance. Unfortunately, I didn’t enjoy the root beer part but the vanilla ice cream did no wrong! Presentation of the float was great especially with the mustache straw. We all had fun with the mustache! 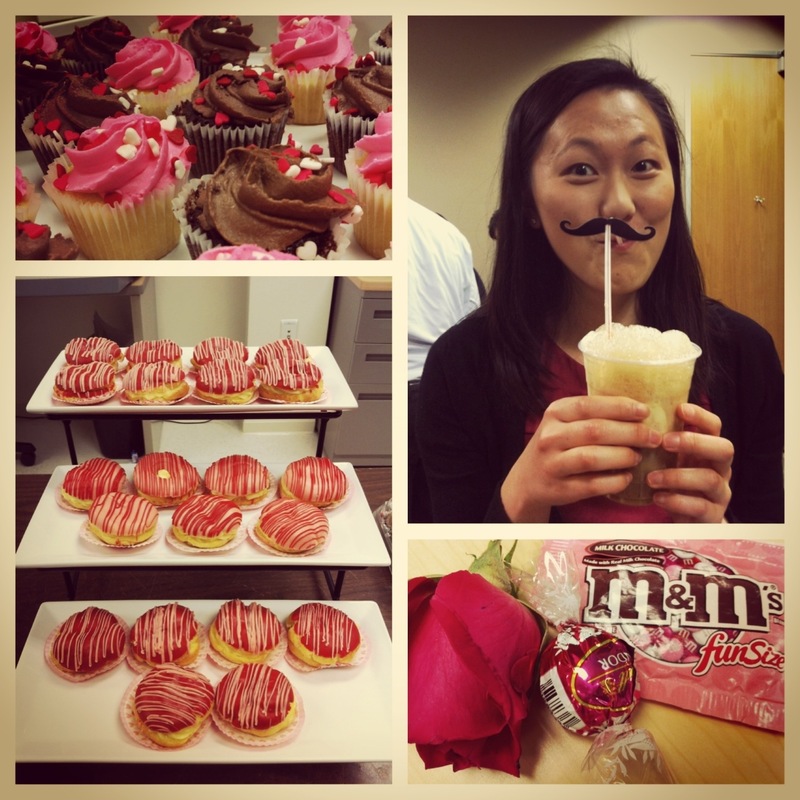 In the Korean culture, Valentine’s Day is a little different compared to the American culture. The roles are reversed where the girls ask the guys to be their Valentine’s. Those who are single on Valentine’s Day end up wearing all black and eat black noodles (aka jja-jja-myung) to mourn their singleness. Sounds depressing, huh? I actually think it’s more fun than not to celebrate the Korean way. Some of my friends decided to plan a single ladies night with a mix of Korean American culture where we dressed up in black but in white also. We didn’t have black noodles but had pizza, chips & salsa, and other goodies instead. Thanks to Anne we had Banberry Pie from Polly’s Pie! Banberry Pie is probably one of the best creations of pie in this world. Banberry Pie = Banana cream pie topped with strawberries. We ate. Played the game naked. Oh, what? Naked? Let me clarify. We did not get nakey. That is just wrong. It has nothing to do with being/getting naked. It’s a game where there are two teams. Every player writes a word or phrase on a piece of paper. Round one try to guess the phrase by explaining it verbally. Second round you do charades. Third round, say one word to describe the phrase. Under time restriction, teams try to guess the correct word as fast and as much as they can. Whichever team guesses the correct word/phrase the most, then wins. It’s a fun yet intense game to play. I tend to get really loud when playing. That’s just how intense I play. No more serious Asian faces. Thanks to Esther, Elaine, and Michelle putting this all together! It was my first time celebrating Valentine’s Day Korean style. I had fun eating and laughing with everyone.